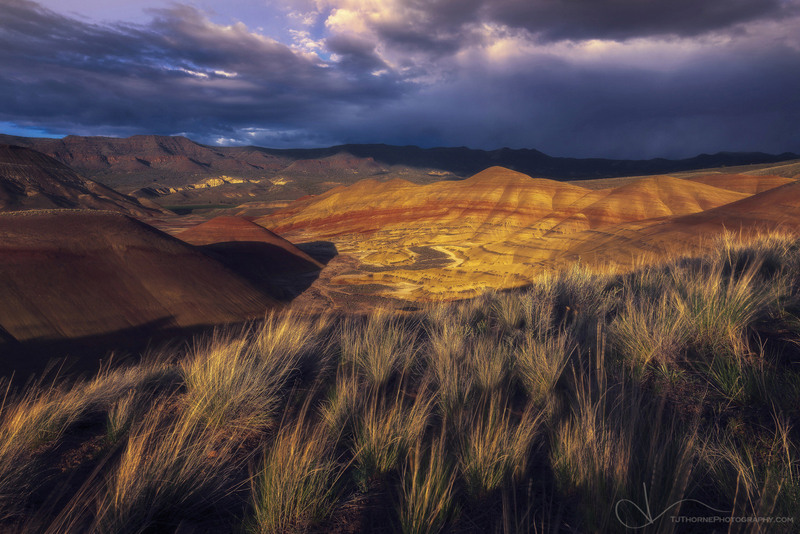 Sunset light falls on the Painted Hills, Oregon. Holy crap do I love Oregon. We have so much diversity so close. At the last minute I decided to make the 9 hour round trip drive out to the Painted Hills. The forecast called for scattered thunderstorms... so it was quite a gamble going here. And while I always hope for good light, what I was really after was.. nothing. I wanted to be around nothing. This spot isn't REMOTE. But it's out there. Far enough away that you don't hear the cars.. that you have to wait for cattle to move off the road.. that all you hear is the sound of the wind and your breathing as you inhale the scent of sagebrush and juniper. I was luckily treated to some very nice light... which doesn't happen to me a lot. That's just the cherry on top of an escape. Nine hours of driving. Two hours of nothingness and the sticky smell of juniper all over my hands. I love where I live.